Few vehicles do as many things as well as the 2011 Honda CR-V. As practical as a backpack, this benchmark crossover is an easy, stylish one-size-fits-most car choice. 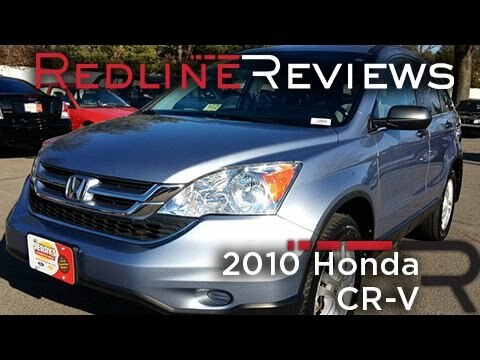 My honest review of a 2011 Honda CR-V with eco mode. There is a Bluetooth option but it only allows you to pair with one device and you cannot delete it. Being a used car, the previous owner is paired with the vehicle so I am not able to. It is very comfortable with armrests and has a lot of storage options. It is great for driving kids around and hauling things. I wish there were seat heaters though because I live in Minnesota and it is cold in the winter. It has almost 100, 000 miles on it and is still very reliable. It has an "eco" mode so that you can be eco friendly. I am not sure if it saves gas or not but the tank seems like it is big and with the eco filter on, you can save some mileage and not have to get gas so often. There are not many features to the car but it does have controls on the steering wheel which is easier than having the change the channels manually. The center console has a usb, auxiliary, and cigarette lighter for phone charging and other accessories. The windows are automatic but only the drivers window is a one-touch. The sound system is ok and does not really have a lot of change in bass or other Audio settings. The seats are cloth seats which is probably why there are not seat heaters in it. The seats and trunk are capable for child car seats and have the safety features for attaching them to either of the three seats or all of them. Nothing goes wrong, my mechanic keeps me oiled up and it gets good gas mileage. Typically Honda vehicles do not have many problems that are complicated. Filters, sensors and the like can be replaced quite easily with a basic high school knowledge in mechanics. Problems arise when locating a honest tech or when something major breaks. I cannot help with the former except that when you find one spread the word, tell your friends. Make certain that he does not go out of business. A preventative maintenance program will help keep performance of this vehicle in tip top shape. I have not had any problems other than tires, but that does not count. I live in a desert and once in a while I need a sweater because the ac works extremely well. There's no problem with leg room nor have I had any complaints from passengers having to eat their knees. Of all the features I have the best one is the Audio system. When you hear me coming you hear the whole song and not just the bass! Family vehicle that works well and fits everywhere! I absolutely love this car! It is never had any mechanical issues, even though the manufacturer's warranty is several years expired. It runs well and all that is been done is the routine maintenance. It is got leather interior that is still in great shape and very easy to clean. The backseat is roomy enough for tall adults and large dogs. The trunk easily fits a large jogging stroller with plenty of extra space. It can be two tiered for stacking lots of groceries or hiding anything from view on the bottom. The satellite radio is also a great feature that I love. My only complaint is that it does not have a built in Bluetooth. Honda (American Honda Motor Co.) is recalling certain 2007-2011 Honda CR-V vehicles which have had the passenger frontal air bag replaced. The air bag inflator repair kit may have been assembled by the supplier with an incorrect wire harness. If an inflator with an incorrect wire harness is installed, the air bag may not deploy as intended, increasing the risk of injury in the event of a crash. Honda will notify owners, and dealers will inspect and, if necessary, replace the passenger frontal air bag inflator, free of charge. The recall is expected to begin August 1, 2017. Owners may contact Honda customer service at 1-888-234-2138. Honda's number for this recall is KF9.